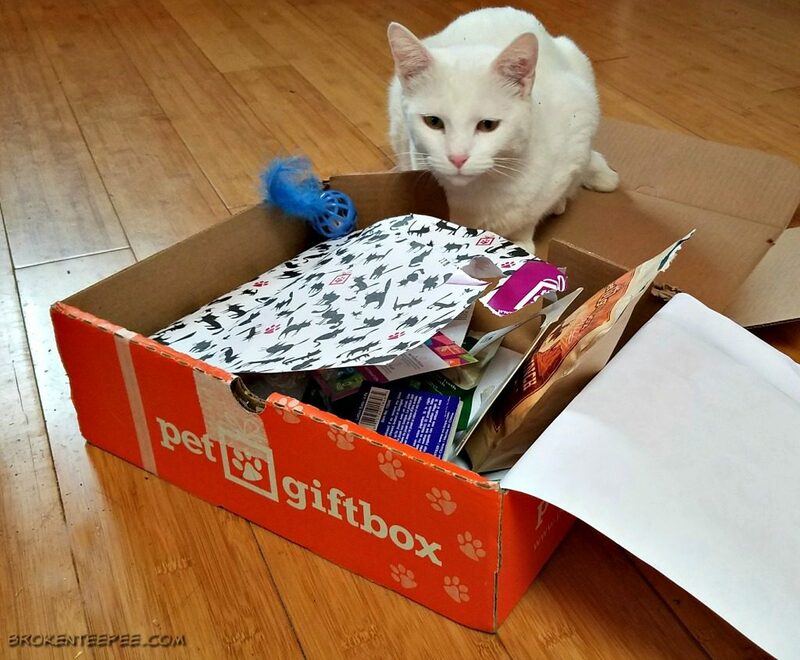 The Farm cats received a three month subscription to PetGiftBox for their honest review. Any purchase links are affiliate links which means if you buy anything through them I will receive a small commission that helps to keep the Farm cats in toys and treats. Let it be noted (again) that the Farm cats are spoiled. Just a little bit – OK a lot! 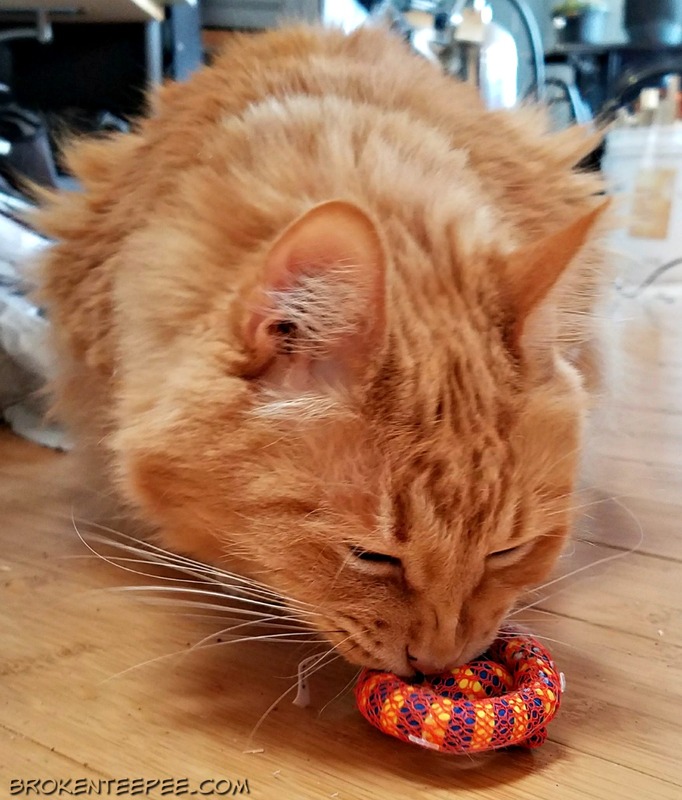 When I learned of a pet subscription box that could be curated specifically for cats or dogs (by weight) I thought, “what a cool idea!” When I learned that the purchase of each box helps to feed rescue pets I was really sold. 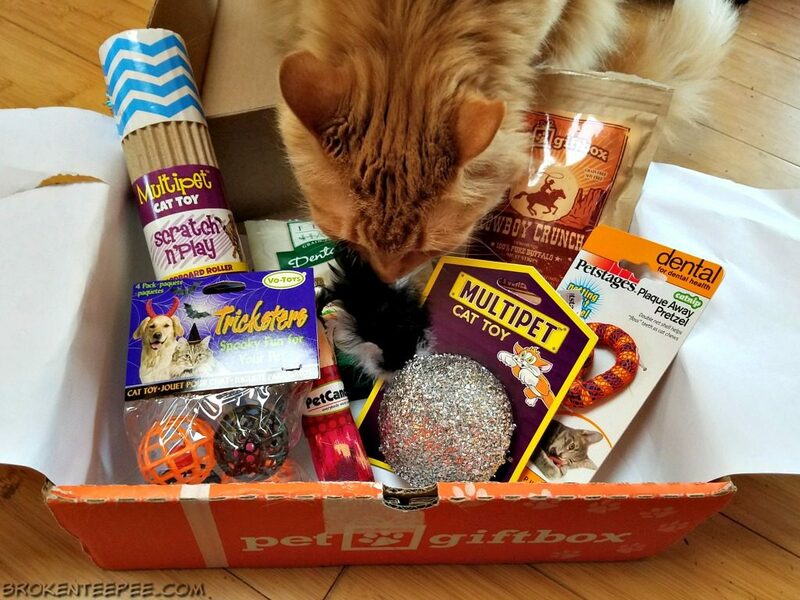 I knew that all of you would love to learn about PetGiftBox too. Cats and dogs in shelters need all the help they can get. 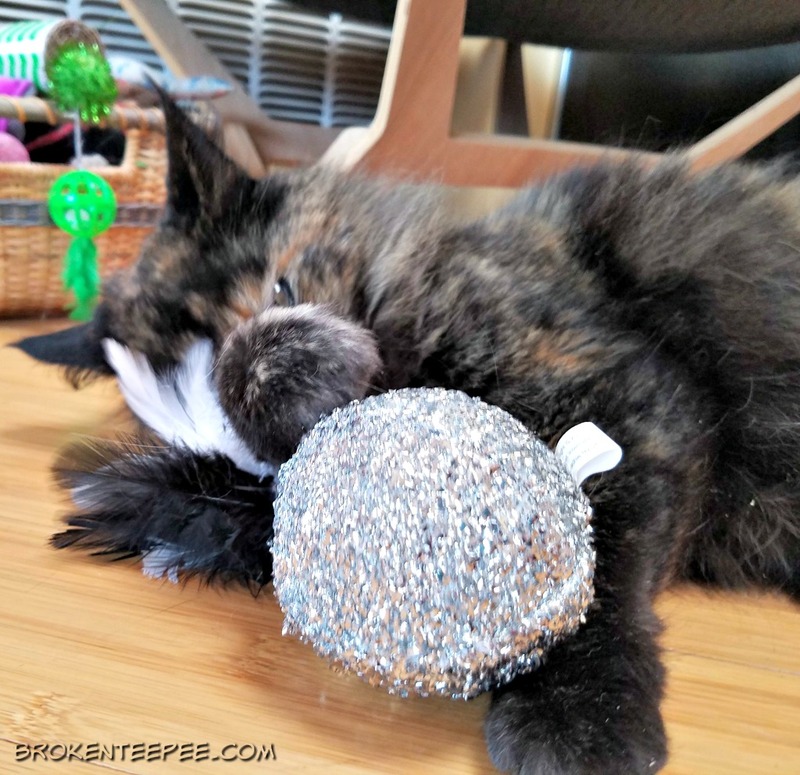 The Loofa Catnip Toy (the gold kicker toy in the photo) has been a big hit with my clowder. I’ve found Snowy and Sherpa playing with it at various times. I know a toy is popular when I find it in different places. The ones they don’t play with stay in the toy basket. The Beef Treats (freeze dried beef lung) were all gobbled up; all of the Farm cats liked them. My cats have many wand toys so I put the Fluttery Butterfly aside to go to AniMeals. As to the disposition of that lovely blanket, what did you think would happen? 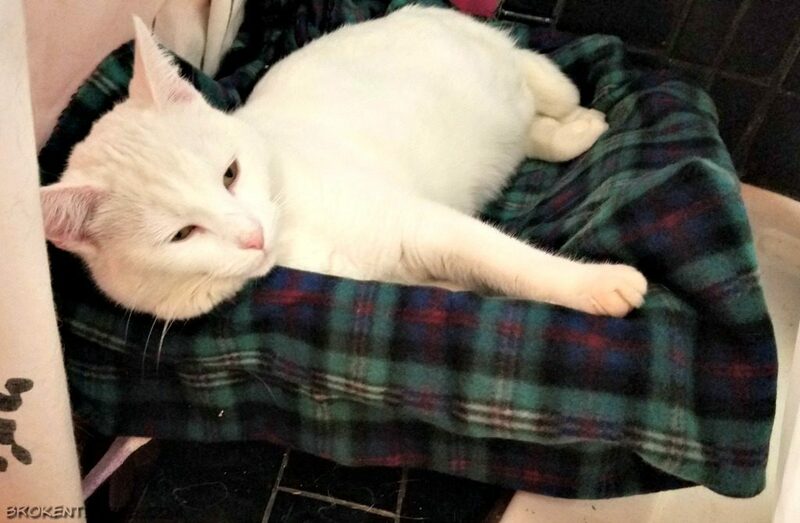 Snowy did get it for her bed. But we all knew that is what was going to happen, didn’t we? It is an incredibly soft blanket and she does love to sleep on it. I had set up this box for her when she first came in to the yurt. It’s in the bathroom and it lets her get away from all of the other cats for a bit. I have also caught Stinky and Harry sleeping in the box too. This box arrived the end of January and it was a “Best of 2016” box. This was very exciting for the Farm cats as you will see in the video, all five of them came to see what was inside. I don’t think I’ve ever had all five of them in one place before like that. You can see how much they all enjoyed the Best of 2016 pet subscription box in the video below. I will warn you – the Claws Of Death make an appearance! Snowy has not completely mastered her manners. Another great box full of great products. I will note that they did not like the Cowboy Crunch Buffalo Treats. They were like jerky and no cat would eat them. I am going to give them to a friend with a dog. The Dental Crunchy Treats though, were a bit hit and might just cure Harry of his erm, problem addiction to with certain other cat treats that shall remain nameless. The big hit of the box was the PetCandy Catnip Toy. 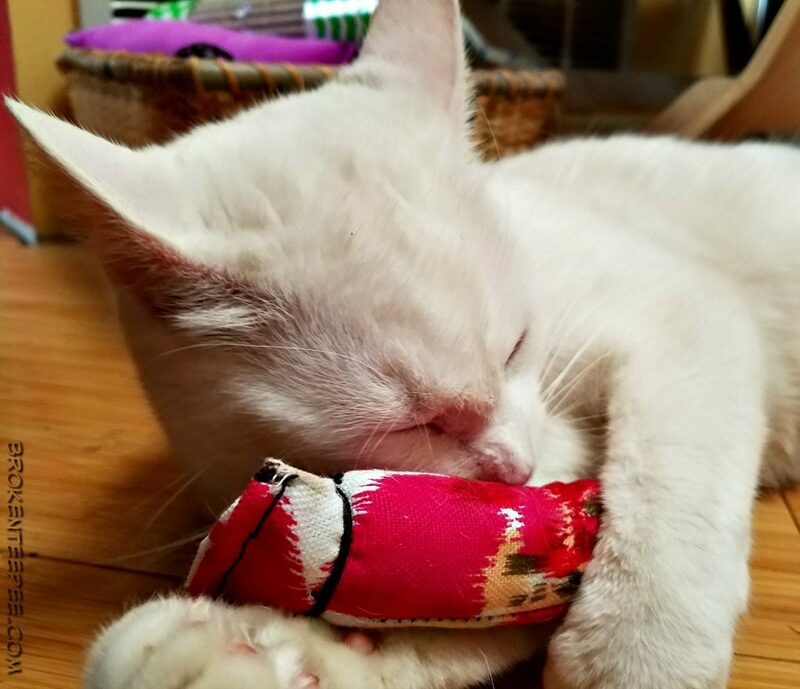 Every Farm cat has fallen in love with this toy. I don’t know what kind of ‘nip is in it but it must be some kind of powerful. The big sparkle ball has been fun too. They love little ones and feathers are always popular so I knew that a toy with both was going to be popular. The Scratch and Roll toys have proven to be on the meh side. They are pretty much ignored. I’m going to put them aside with the wand toy for my next trip to AniMeals. Snowy looks a bit perturbed that she didn’t get to keep all of the contents for herself. It doesn’t work that way in a multi-cat household. Or maybe she wants me to empty it out so she can have the box. Hmmmm. You can sign up to get your pets their very own PetGiftBox and I have no doubt that they will love it. 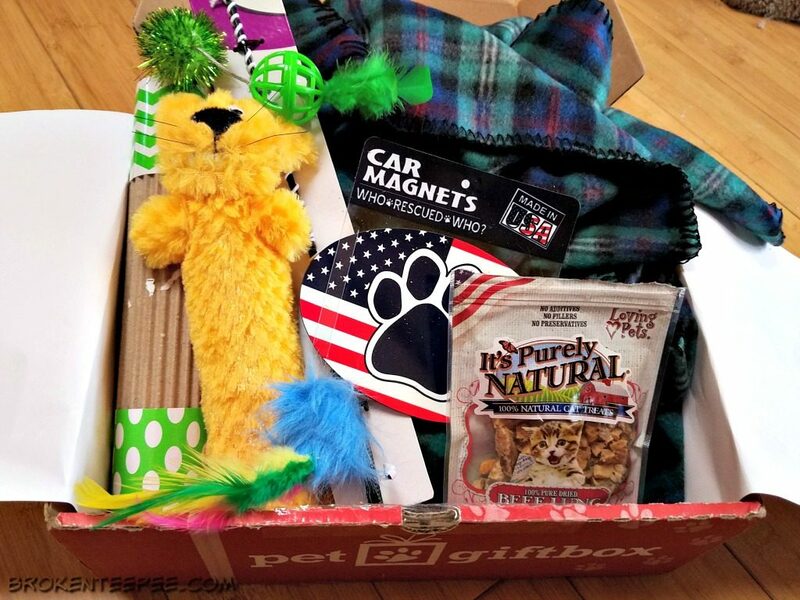 By signing up for PetGiftBox you start accumulating reward points that you can use towards future purchases. Boxes auto-renew the first day of the month and shipping is free (which means the cost is included in the price of the box) You can cancel at any time. Boxes start at $25 and you can sign up for your pets or gift a box to a friend. Gift certificates are available. I know how excited I was to get the first box, then I really looked forward to the second and now I can’t wait for the third. If you follow my Instagram Feed you will see all of the joy this pet subscription box is bringing to the Farm cats.